Bandhavgarh; not one but many! 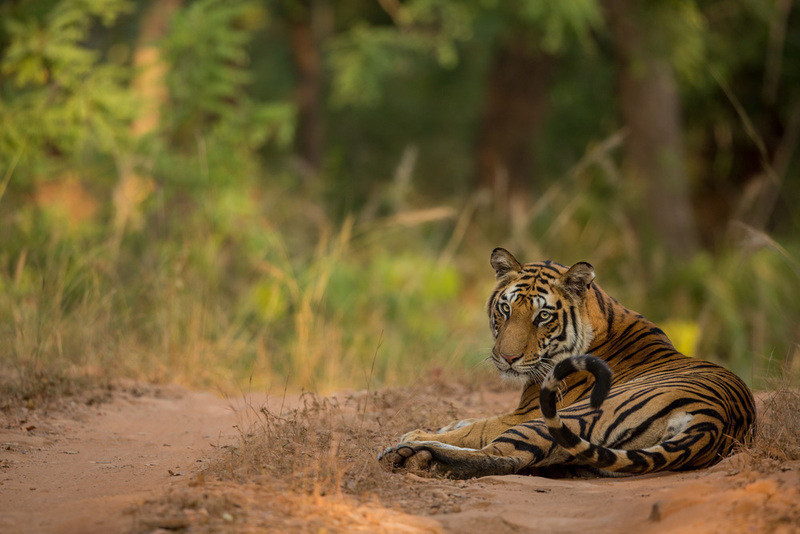 There is not one, but many reason why Bandhavgarh National Park is a unique territory for the tiger. She emerged from the bamboo, striding right past our jeep. This is her land, her territory, and we are nothing to her. Tiger (Panthera tigris). CLICK IMAGE for full screen. It’s a 105 square km expanse of dry deciduous forest around its namesake hilltop fort, and expands to 437 square km when including the buffer zone. The fort hill dominates the landscape. CLICK IMAGE for full screen. The tiger (Panthera tigris) vanishes into the bamboo with no hope of seeing them again until they reemerge. CLICK IMAGE for full screen. ...and open meadows, interspersed in the forest. CLICK IMAGE for full screen. We start our day early, arriving in the park at sunrise. The sunrise and morning mists invites imagination. CLICK IMAGE for full screen. Sitting, listening to the forest, and hearing what it has to say, hoping for the calls that a tiger is near. Monkeys play and socialize in the meadow areas, but never straying too far from the safety of a tree. Rhesus macaques (Macaca mulatta) grooming, an important social behavior establishing bonds and hierarchy. CLICK IMAGE for full screen. Grey Langur (Semnopithecus) running for the next tree cover. CLICK IMAGE for full screen. ...to the next safe haven. Grey Langur (Semnopithecus) sitting more comfortable in the safety of a tree branch. CLICK IMAGE for full screen. The grassy meadows add a different dimension to the ecosystem, providing grazing land, and hunting land alike. Chital, or spotted, deer (Axis axis) wade through the sea of grass in the evening light. CLICK IMAGE for full screen. A lone Chital, or spotted deer (Axis axis) in a large open clearing. CLICK IMAGE for full screen. Birds are always present here, and the health of the forest is evident by the large numbers of raptors. The more raptors, the more prey, and the healthier the forest must be to sustain them. A Changeable hawk-eagle (Nisaetus cirrhatus) sits waiting, and watching for possible prey. CLICK IMAGE for full screen. Crested serpent eagle (Spilornis cheela). CLICK IMAGE for full screen. …and with every gust of wind or passing vehicles, dust is thrown into the air, creating sun beams and a mystical feel to the forest. But these dusty tracks give us the best insight into tiger movements; pug marks! We're getting close. A tiger pug mark left in the sandy road. CLICK IMAGE for full screen. It is not only the tiger that enjoys these roads. Here a pack of four Jackals roams the road before disappearing off in search of their next meal. Golden jackals (Canis aureus). CLICK IMAGE for full screen. Venturing for closer look at us, the invaders. Golden jackal (Canis aureus). CLICK IMAGE for full screen. Bandhavgarh has a high density of tigers, and the evidence is everywhere. The excitement builds as we find more and more markings. Tiger claw marks on a tree... we are truly in tiger territory. CLICK IMAGE for full screen. Chital, or spotted deer (Axis axis). CLICK IMAGE for full screen. The Gaur, or Indian Bison, was re-introduced to the park when 50 individuals were moved here from Khana national park in 2012, and have since flourished. More tiger food; one could sustain a tiger for over a week. A Gaur, or Indian Bison (Bos frontalis gaurus). CLICK IMAGE for full screen. A Nilgai (Boselaphus tragocamelus) mother and calf feeding. CLICK IMAGE for full screen. Nilgai (Boselaphus tragocamelus). CLICK IMAGE for full screen. And of course, there are Sambar deer, which are prime targets for the tigers. A Sambar (Rusa unicolor) standing proud. CLICK IMAGE for full screen. With such dense and varied habitats, the tigers are very well camouflaged, only offering fleeting glances between bamboo thickets or gaps in the trees. Tiger (Panthera tigris). CLICK IMAGE for full screen. A tigress and her four cubs lay hidden in the grass, invisible to all except those who see her enter and leave, and the Bulbuls who feed in this meadow. It is impossible to see the hidden ghosts that hide within. CLICK IMAGE for full screen. There are 32 hills in the park, and all combined makes it an excellent landscape for ambush predators like the tigers to raise a litter of cubs. Tigeress (Panthera tigris) crossing. CLICK IMAGE for full screen. ..he follows in her footsteps, literally. Tiger cub (Panthera tigris) crossing the road after his mother. CLICK IMAGE for full screen. However, tigers like walking along dust roads too with their padded paws enjoying the smooth and soft feel, and it is often a nice spot to rest. While taking a sunset stroll! There is a lot of life everywhere you look here, and people overlook that by saving tigers, we are actually saving the forest, and all of its inhabitants. A cause worth fighting for, so that one day, when my son is old enough, I too can show him the beauty of Indian forests, tigers included. But until then, I hope this is not the last we will see of them. The Tiger (Panthera tigris) walks away from us at the end of the day. As I watch her disappear, I hope that we will see her reemerge, and that this is not the last we see of the Indian Tigers. CLICK IMAGE for full screen. So here is my photo story: I have tried to tell the story of the park as I experienced it, and to give any and all readers a feel of what it was like there. You can see the high res images if you click on them, and please let me know what you think of it in comments at the end. I hope you enjoyed!